systems on a competitive budget helped us to evolve the best business model tailored to our needs. 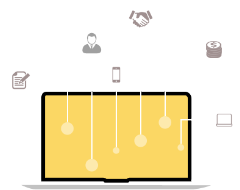 This model envisages the entire customization process as an amalgamation of activities done in the client location as well as in our development labs. This business model was established to provide the right quality solution at a reduced price with the planned turn-around time. 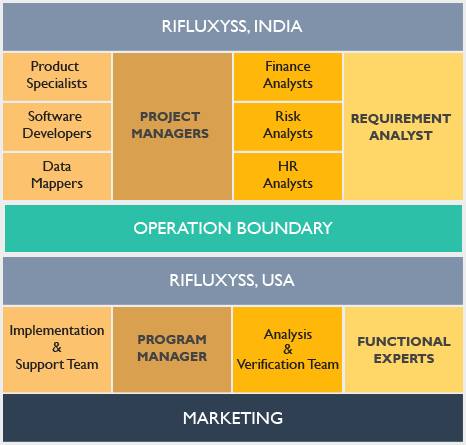 The Hybrid model consists of the joint working between the onsite (U.S Office) and offshore (Indian Office) team and it assigns strict responsibilities of each member of the team based on location of operation. The core sensitive activities are defined during initiation and scheduled to the on site team. 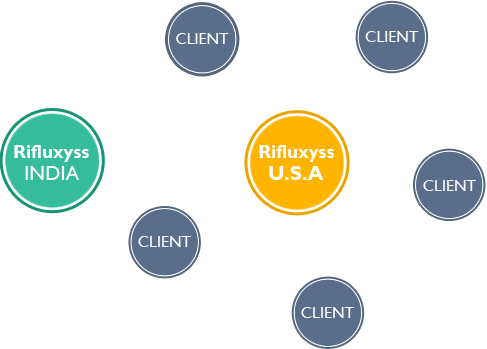 All the other process intensive tasks are outsourced to the Rifluxyss technical team located in the Indian facility. Our objectives are clear and constant efforts are channeled to realize these objectives. The roadmap of our future is etched in every action that happens in Rifluxyss. The goal of supplying well-structured customized solutions for business systems on a competitive budget helped us to evolve the best business model tailored to our needs. well-structured communication and workflow path called the CORE ACTIVITY MODEL. on a high priority basis. This leads us to zero percent data loss during communication between the boundaries. Documentation, Training, Implementation, Support, and Customization become a joint effort on both sides of the operation boundary. defined inside the boundary, the controlling and managing of the same is easier.